When a rabbit hears a weather report that spring has arrived, he is chagrined to find snow outside his abode. The good citizen writes a letter suggesting a more regional approach, thus inspiring a nationwide search for talent and the best newspaper ad since art schools asked wanna-be's to sketch Tippy Turtle. "Have you got what it takes to be a weather forecaster? Take this quiz and check all that apply: Are you a mammal?...Are you furry?...Do you live in a burrow?...Are you a rodent?...Are you an herbivore?...Do you hibernate?...If you checked all 6 boxes, you're invited to attend GROUNDHOG WEATHER SCHOOL!" After a hilarious couple of pages in which monkeys, pigs and porcupines fail to pass (and one skunk is accepted as a "foreign exchange student"), readers are immersed alongside as students undergo a rigorous education, including learning about "famous furry hognosticators" such as Wiarton Willie in Canada who predicts the Super Bowl outcomes and General Beauregard Lee who landed a gig on the Today Show and has an honorary college degree; other ways in which nature predicts weather (bees stay near their hive and pinecones fold inward when wet weather is impending); the reasons for the seasons, how to burrow, how shadows work, and then (gulp!) take the final exam! After all this effort, will the weather report be more accurate? How many books would a woodchuck read if a...well, you know! 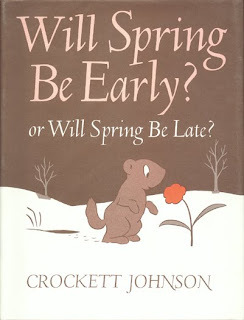 GEOFFREY GROUNDHOG PREDICTS THE WEATHER by Bruce Koscielniak (Sandpiper) An especially funny take on the day, in which our hero struggles to keep up with past performances. Loose-lined cartoon illustrations in the spirit of James Stevenson add to the good humor. 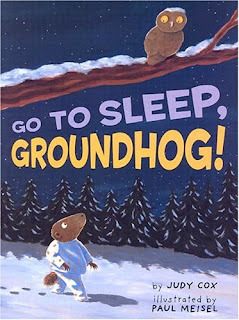 GROUNDHOG STAYS UP LATE by Margery Cuyler, illustrated by Jean Cassels (Walker) A particularly handsome book for the holiday, the groundhog tale gets a trickster spin when a slacker woodchuck chucks all responsibility to play through the winter. Along the same lines, GO TO SLEEP, GROUNDHOG! by Judy Cox, illustrated by Paul Meisel (Holiday House) features another furry fella who won't get to sleep, but this time it's because of insomnia, not guile. No worries as a witch, a turkey and Santa all try to to tuck him in and get him settled in time for Spring. Gouache illustrations are sweet and superb for sharing. 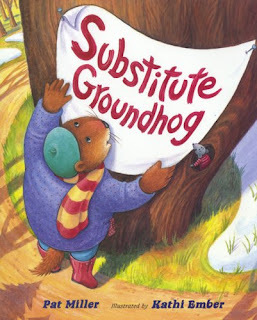 SUBSTITUTE GROUNDHOG by Pat Miller, illustrated by Kathi Ember (Whitman) Groundhog holds animal auditions for a temp to fill in on a sick day in this storytime favorite. TEN GROUCHY GROUNDHOGS by Kathryn Heling, illustrated by Deborah Hembrook (Cartwheel) Eek, these groundhogs look quite a bit like teddy bears, but if you can get past this, it's a merry countdown with plenty of chances for audiences to chime in. A good pick for preschooler gatherings. GRETCHEN GROUNDHOG, IT'S YOUR DAY! 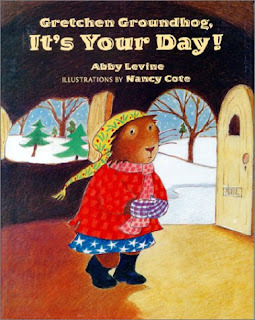 by Abby Levine, illustrated by Nancy Cote (Whitman) What to do when a groundhog is too shy to make her appearance? It's nice to see a female groundhog character, and the illustrations have lots of homey detail; readers root for Gretchen's success. Meet another shy groundhog in Kate McMullan's FLUFFY MEETS THE GROUNDHOG (Cartwheel) one in a series of adventures of a class guinea pig with a very distinctive and hilarious voice, and a solid choice for emergent readers. While the guy in Groundhog Gets a Say may be right, we may need more than one day to read all of these fine fictional stories, we might remember to mix in a little non-fiction as well. GROUNDHOG DAY by Michelle Aki Becker (Children's Press) is a slim but handy volume for looking at actual photographs of the icky critters (sorry, I'm not really an animal person, they look a little "bitey" to me). Gail Gibbons is a trusted nonfiction author that delivers plenty of interesting history in GROUNDHOG DAY! 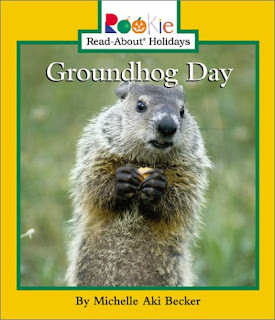 (Holiday House) and the concise GROUNDHOG DAY BOOK OF FACTS AND FUN by Wendie C. Old (Whitman) is so overflowing with trivia that surely it would be part of the Groundhog Weather School's curriculum, and deserves a place in yours as well. It's hard to resist such a quirky holiday! Hey, any reason to celebrate...and to read great children's books. Great list of Groundhog titles! I especially enjoyed meeting Joan Holub at Kidlitosphere in the Fall. I also like how you included non-fiction in your list. Nice job! 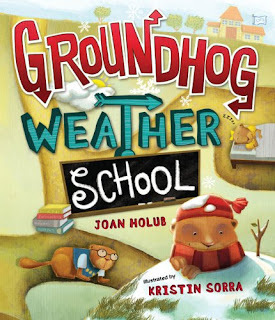 Thanks for including Groundhog Weather School in your wonderful list, Esme! I think you caught all the picture books and early readers about Groundhog Day that I know of. Yay you! 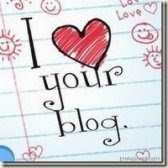 Thank you very much for featuring my book, GROUNDHOG GETS A SAY, on your blog. 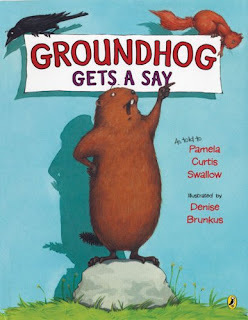 You feature other wonderful groundhog books as well -- hurray for the marmotophiles!